If you were to imagine a specific car that, in your own mind, possessed the qualities of protector, or a guardian; what car would you choose? 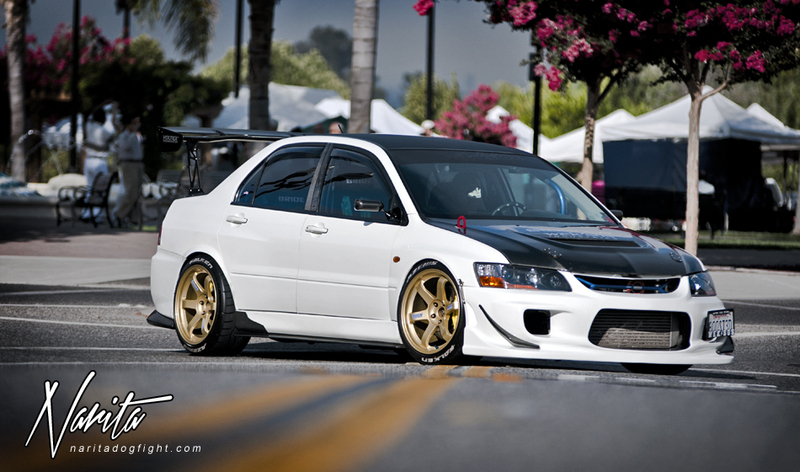 For me, it would always be the Mitsubishi EVO. Something about it just gives off a ‘sentry’ feel. Perhaps it’s the bold, boxy lines, it’s potential for great power or even it’s masculine stature. There is quite obviously a good amount of guardian like character in any EVO, but this one in particular, has more than most. 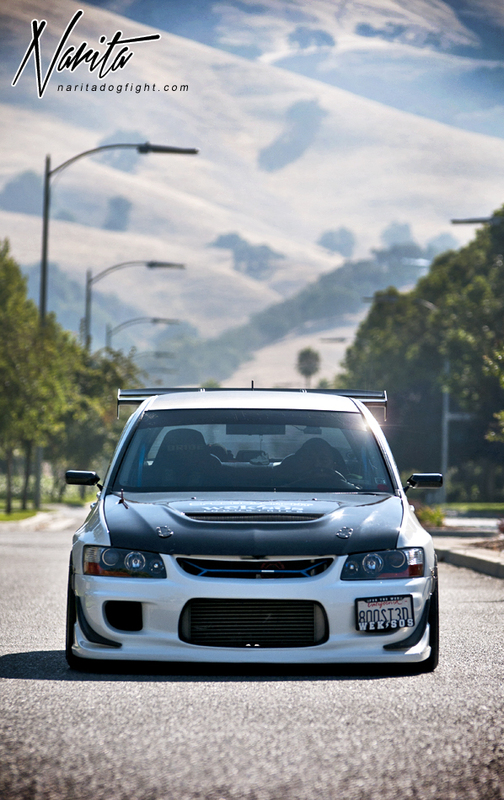 I’ve never seen where Algier lives, but I bet I would feel pretty safe with his EVO standing watch over the neighborhood. Right, I’ll admit that the theme to this feature is a little far-fetched; but it’s still a bit amusing if you think about it. Modified cars coming to life to protect…the…people…oh my god I’m describing Transformers…damn. I knew I had heard of that concept somewhere. Anyway, all that aside, Algier has put together an extremely quality build that I’ve really taken a liking too. This past weekend I flew up to the bay area and made the short trip over to San Jose the next morning to meet up with Algier. He had just spent the entire previous day at HIN so I was thankful that he was able to make it out for a few hours the next morning. 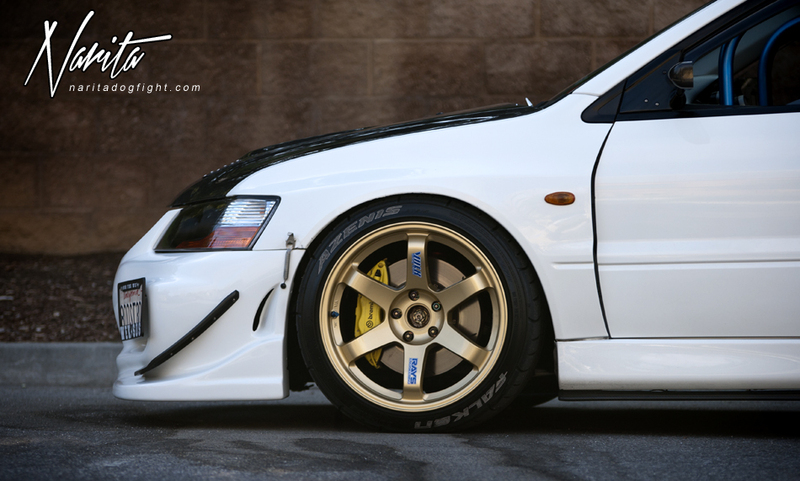 Click past the break to see more of this insanely clean 8. When I had talked to Algier the day before, we had agreed to do the shoot in a cool little plaza in San Jose. The plaza was surrounded by some unique buildings and store fronts that would have provided some great backdrops, but unfortunately when I had arrived at the location, there was a farmer’s market going on. We were there pretty early, but there was still quite a bit of traffic. Algier made a couple circles around the plaza and blocked traffic as needed so I could make the most of the situation – pretty sure the market goers weren’t the happiest, but oh well. 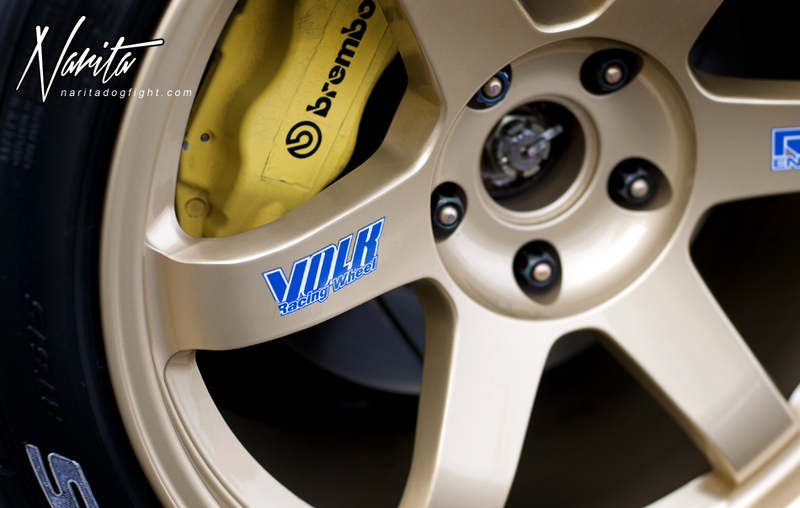 By far the most eye catching items on this car are the Top Secret Gold Volk TE-37’s that nicely satisfy the wheel wells of the vehicle. 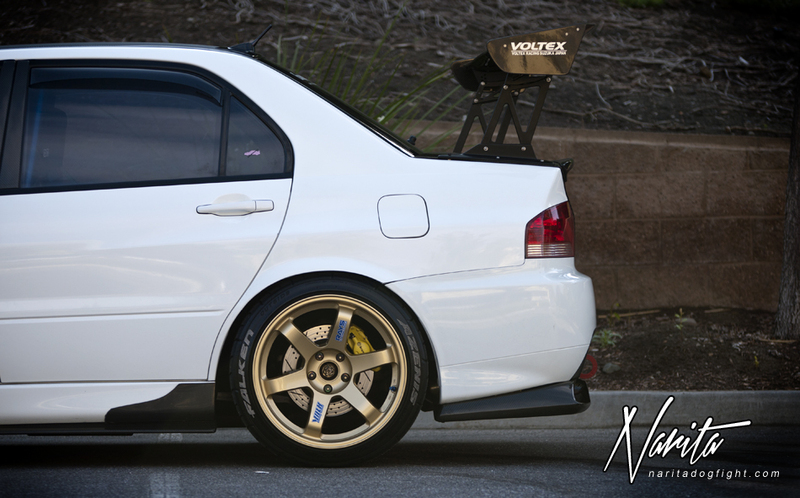 You may have seen this car before, but chances are you saw it when he had gold Advans, and not the Volks. I really like the look of the new wheels setup. I also like how the Porsche yellow Brembo calipers pop from behind the rim. 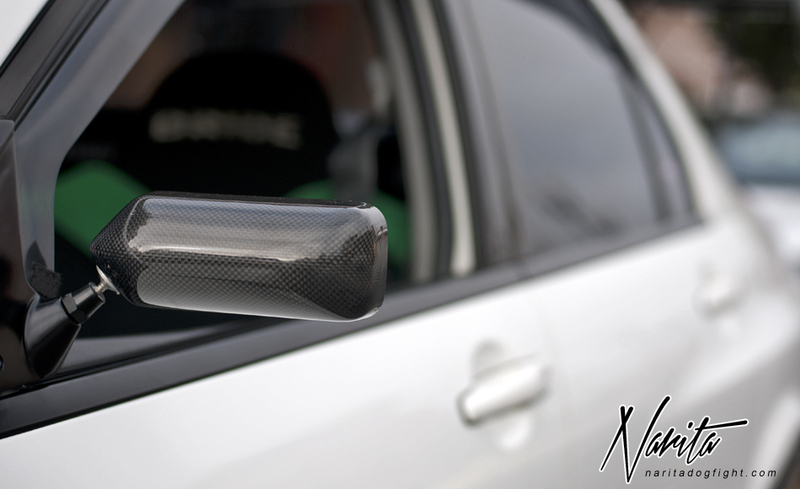 …but how many people do you think notice the carbon Varis B-Pillar garnishes? In case you were wondering, these are discontinued and I’m assuming extremely hard to find. Aside from being awesome, they also provide a good transition from the carbon wrapped roof. 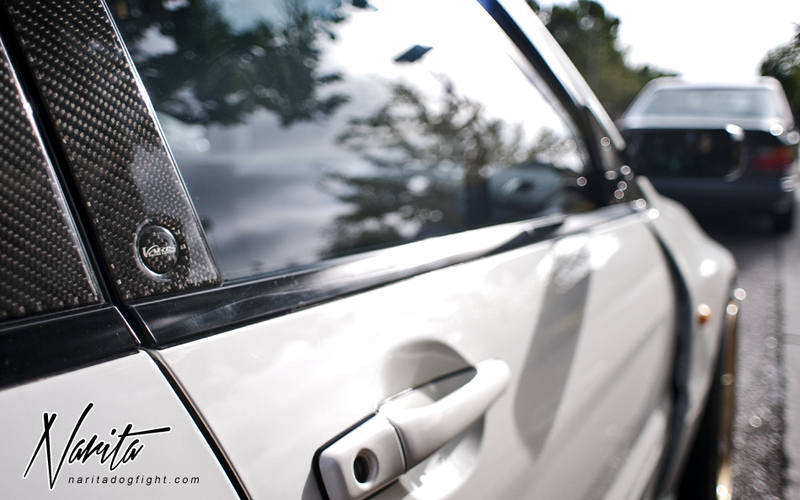 Yes, for cars like this, it’s all about the details. Rather than buying a complete kit, Algier took the time to piece something truly unique together – and it works. It works very well. 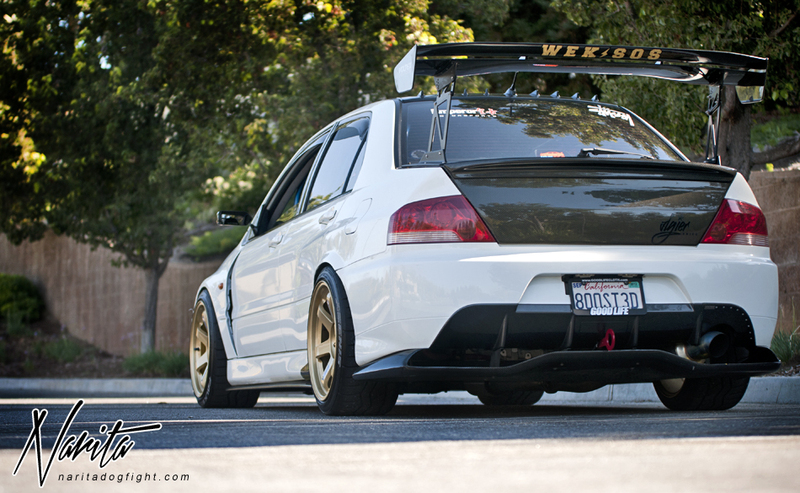 Often times people try this route and the end result is far less visually appealing that this EVO is. 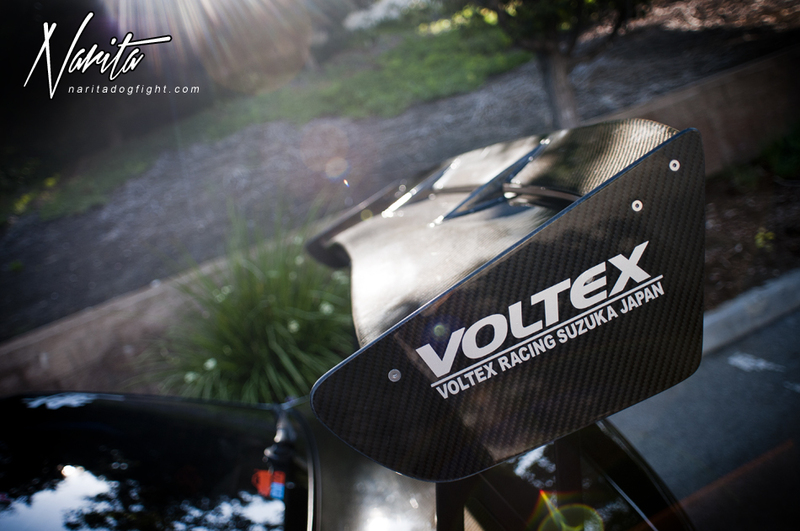 …the Voltex rear diffuser directs airflow from underneath the car. 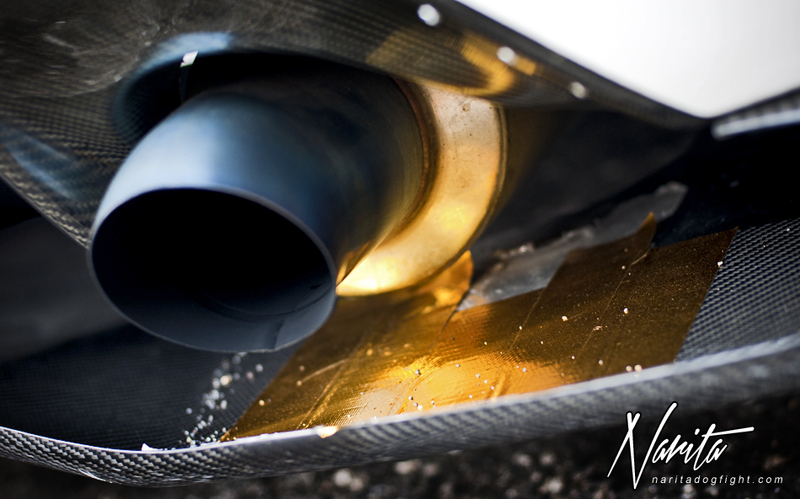 A couple strips of gold heat conduit help protect his investment from the extreme temperatures that his ultra rare titanium Garage HRS exhaust is expelling. It also makes a nice tray for collecting gravel; if you’re into that sort of thing. 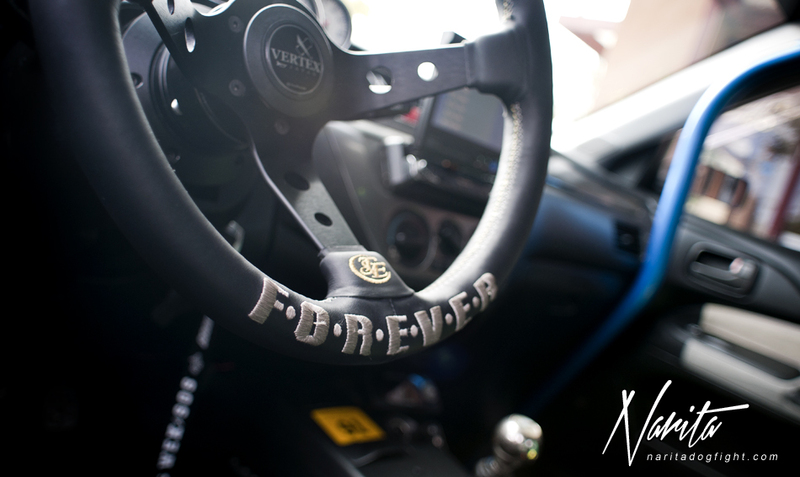 Under the covers, the stock block has been caressed with a handful of choice mods – the star of the party being the Tommi Mackinen 6.5 turbo. HKS camshafts and sprockets, and and upgraded fuel system all dance to the tune at a very satisfying 400whp. A Cusco twin-plate clutch and flywheel aid in transferring the power to the ground. 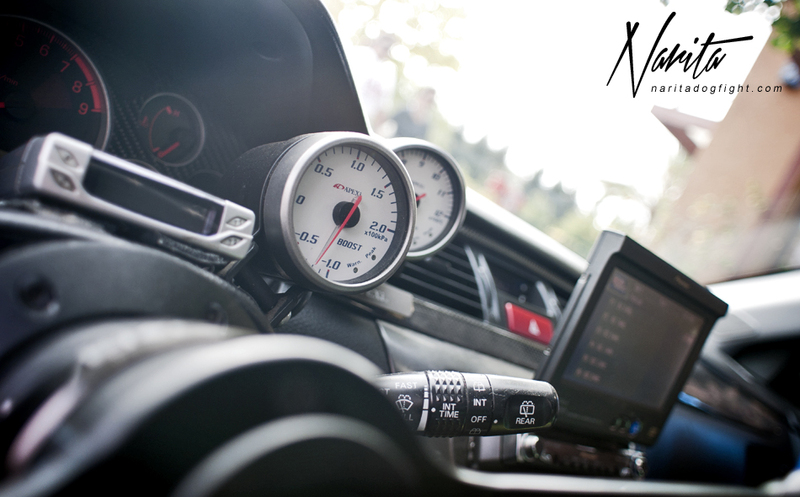 Things stay the course on the interior as well, with even more quality touches to match the exterior. So regardless of whether you live in the area or not, think twice about crossing paths with this one. While it may look noble, and refined, you don’t want it showing it’s true colors. I’d like to thank Algier for taking the time out of his busy schedule to come snap some shots. 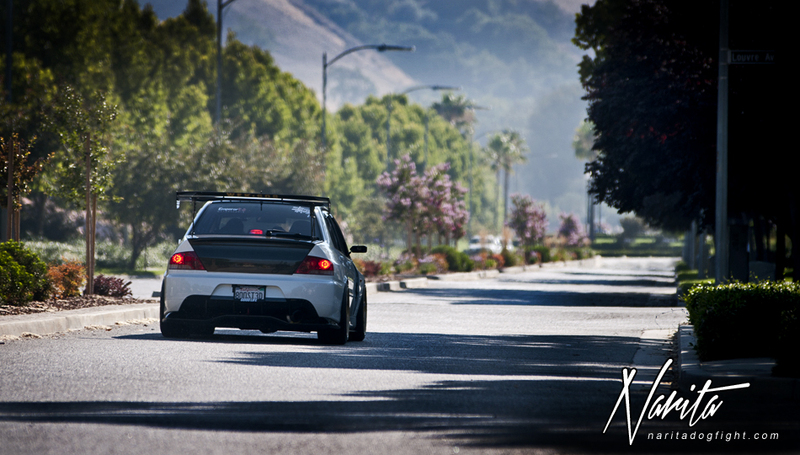 I know with a new addition to the family time is precious and I’m glad I got to spend a few hours with his EVO. 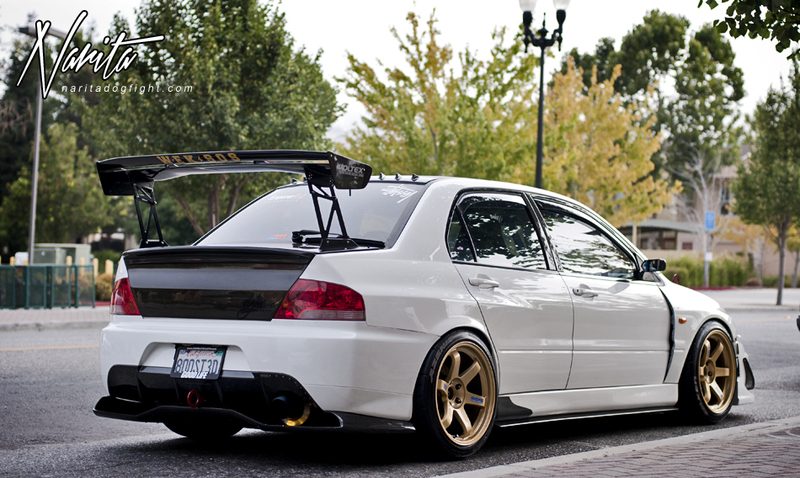 It’s true that Emperor sets the bar for EVO builds, and this is a living example. Can you post Hogh Resolution image, please? Hello – I plan on making a desktop of one of the images, if you have a request go ahead and email me and I’ll see what I can do.